The societal effects of an energy source are important for policy makers. Before approving a new nuclear power plant regulators look at all parts of the facility and its potential impact on the surrounding area. The Fukushima disaster tarnished nuclear’s image even though researchers estimate that just 130 people will die from directly related cancers. Nuclear energy does have some health costs, but the history shows that it is a very safe form of power. In 2007 a study was published that looked at the number of deaths causes by various power sources. Occupational deaths include deaths from mining and refinement to its final use in a power plant. Nuclear’s estimated 0.019 occupational deaths per terawatt hour (TWh) are substantially lower than coal’s 0.10 occupational deaths per TWh. Only natural gas came in lower at 0.001 occupational deaths per TWh. The same study looked at the number of deaths among the public. This figure is very important because this shows the safety of the fuel source for the average consumer. Here nuclear is the clear winner with an estimate of 0.003 deaths per TWh versus 0.02 per TWh for coal and natural gas. How do Safety Concerns Impact Uranium Miners? Uranium miners live by selling fuel to nuclear power generators. If the nuclear power plants were shut down because of health concerns, then uranium miners would go bankrupt. Thankfully this is not the case. Nuclear power is a relatively safe fuel for the public and the miners. Cameco Corporation (USA) (NYSE:CCJ) is one of the world’s top uranium miners. It has decades of experience in developed countries like Canada where worker safety is taken very seriously. Recently it was rated one of the top ten employers in the nation. Its prime mines are found in high yield formations in Saskatchewan, Canada. Additionally, the company operates facilities in the U.S and is exploring in Mongolia. Financially the company is in good shape. Its low total debt to equity ratio of 0.31 is reasonable for a large firm with steady revenue. The high yield mines in Canada help it to remain profitable in the midst of market fluctuations. Its current EBIT margin of 12.9% and profit margin of 11.4% are encouraging. Over the long term uranium demand will be strong and Cameco Corporation (USA) (NYSE:CCJ) is in a great place to meet the world’s needs. 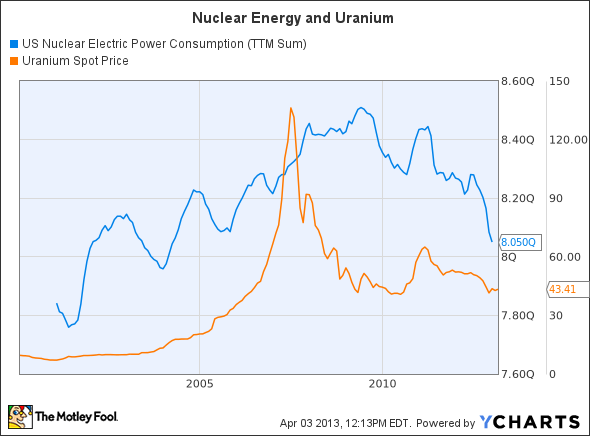 Uranium Resources, Inc. (NASDAQ:URRE) is a small uranium miner and should be treated with caution. The company has promising assets in Texas, but it continues to dilute its shares in order to pay for growth. Recently it purchased Neutron Energy and paid for the transaction by issuing 3.7 million common shares.